On the evening of 28 April 1955 a cold and hungry Edward Te Whiu broke into the house of Florence Smith, a 75-year-old widow, with the intention of robbing her. Smith, who was in bed, heard him break in and turned on the light. Te Whiu attacked her, fracturing her skull, breaking her jaw and nose, knocking out her dentures and breaking the hyoid bone in her throat. She died rapidly from asphyxiation. In a statement to the police after his arrest on 12 May, Te Whiu admitted killing Smith. He knew she was dead when he left the property; he had covered her up before washing the blood off his hands and making himself something to eat. He hadn’t meant to kill her: ‘I only intended to knock her unconscious so that I could look the place over. I must have hit her once too often’. The defence took a similar line at his trial, which began on 25 July and lasted three days. But it took the jury just 35 minutes to convict him of murder. They gave no recommendation for mercy and he was sentenced to death. Many questioned whether the death penalty was appropriate for Te Whiu because of his underprivileged background and childlike mental state. 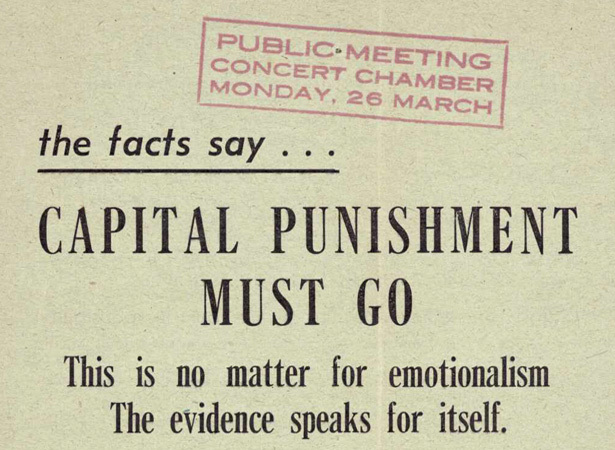 But his execution went ahead at Mount Eden prison at 6.59 p.m. on 18 August 1955. A justice of the peace, several reporters, a priest, doctor and selected police and prison staff bore witness. He was to be the fourth from last person executed in New Zealand. The last was Walter Bolton on 18 February 1957. We have 3 biographies, 5 articles, related to 20-year-old hanged for murder.